At the preview for her new exhibition at the Serpentine Sackler Gallery in London, German artist Hito Steyerl added her voice to the rally against cultural funding from the problematic Sackler family. In the wake of multiple US lawsuits filed against Purdue Pharma, the manufacturer of the highly addictive opioid painkiller OxyContin, there has been an increasing amount of backlash in recent weeks to Sackler philanthropy in the arts. The pharmaceutical company owned by a number of Sackler family members is being sued in the US by more than 2,000 city and county authorities for its alleged role in aggressively marketing the drug and downplaying its dangerousness, which has led to more than 200,000 deaths since 1999. In March, the National Portrait Gallery chose to decline a 1-million-pound gift from the family, following the lead of American art photographer Nan Goldin, who had told the gallery that she would refuse to allow a planned retrospective of her work to take place there, if the money had been accepted. Goldin has been at the head of protests in the US against Sackler donations to cultural institutions, including the Metropolitan and Guggenheim museums in New York. The Guggenheim has since announced that it too would no longer accept gifts from the family. More recently in the UK, the Tate group of British galleries made the same announcement in solidarity with a growing number of institutions, stating, “In the present circumstances we do not think it right to seek or accept any more donations from the Sacklers”. Hito Steyerl. Photo by Brill/Ullstein Bild/Getty Images. Steyerl aligned herself with those following Goldin’s lead in denouncing the family and calling for galleries and museums to distance themselves from the Sacklers. At the preview for her new exhibition titled Hito Steyerl: Power Plants, Steyerl addressed what she called the “elephant in the room”, the problematic association of the gallery to “a family who are under a lot of critical scrutiny for good reason”. Informing her audience that she had consulted with Goldin, Steyerl relayed her fellow artist’s primary concerns, insisting that institutions bearing the family’s name undergo an “un-naming” process and that they publicly declare whether they would continue to accept funding from the family. Hito Steyerl Installation view. Design by Ayham Ghraowl, Developed by Ivaylo Getov Courtesy of the Artist. 2019. Drawing on the themes of her exhibition, which explores ideas of power through digital technology, Steyerl said she asked Apple’s virtual assistant Siri to help navigate the issue of Sackler sponsorship, as well as the dilemma of exhibiting in a venue with the Sackler name. The show includes an augmented reality app that allows visitors to see a version of the building’s façade without the Sackler name on it. “There are many ways in which problems can articulate themselves,” she told her audience, “The effect that I’m experiencing, and the arts as a whole, is its toxic leakage. I would kindly ask everyone to help to address this”. 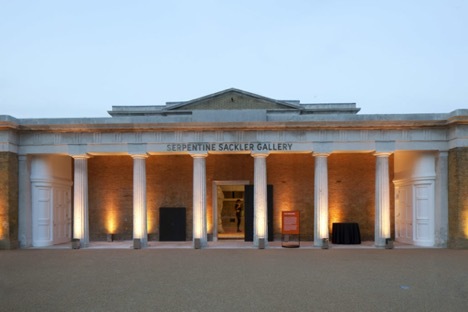 The Serpentine Gallery has since released a statement insisting they have “no future plans to accept funding from the Sacklers”, though no comment on removing the Sackler name has been made as of now. Michalska, Julia and Hannah McGivern. “’Like being married to a serial killer’: Hito Steyerl denounces Sackler sponsorship of museums”, The Art Newspaper, https://www.theartnewspaper.com/news/elephant-in-the-room-hito-steyerl-denounces-sackler-sponsorship-at-opening-of-her-show-at-serpentine-sackler-gallery (accessed April 10, 2019). Rea, Naomi. 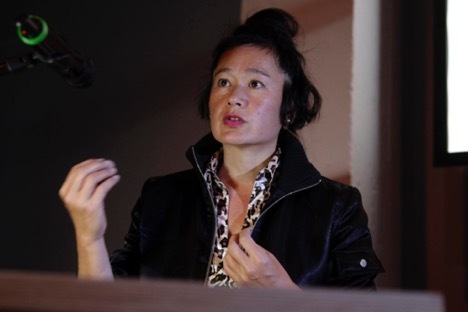 “Artist Hito Steyerl Made an App That Removes the Sackler Name from the Serpentine Sackler’s Façade”, artnet.com, https://news.artnet.com/art-world/hito-steyerl-sackler-1513042 (accessed April 10, 2019). Walters, Joanna. “Tate art galleries will no longer accept donations from the Sackler family”, The Guardian, https://www.theguardian.com/artanddesign/2019/mar/21/tate-art-galleries-will-no-longer-accept-donations-from-the-sackler-family (accessed April 10, 2019). Stapley Brown, Victoria. “Guggenheim Museum says it ‘does not plan to accept any gifts’ from the Sackler family”, The Art Newspaper, https://www.theartnewspaper.com/news/guggenheim-museum-says-it-does-not-plan-to-accept-any-gifts-from-the-sackler-family (accessed April 10, 2019).